Keep track of the emails sent to leads and customers. Canned replies and more! Emailing your contacts is something you should definitely be doing. 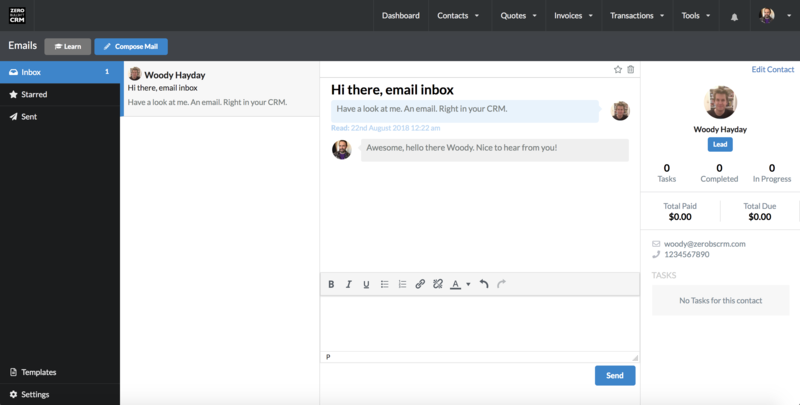 So start emailing professionally, from your CRM, and keep up with all communications within your team. Click send email from your contact page, or type and search for which contact to email. Then draft and send your message in a matter of minutes. Want the key info about your contact to hand as you write that follow up? No problem. The contact panel is there to help. Manage the communications to your contacts. See what has been sent and if it has been read by your contact. 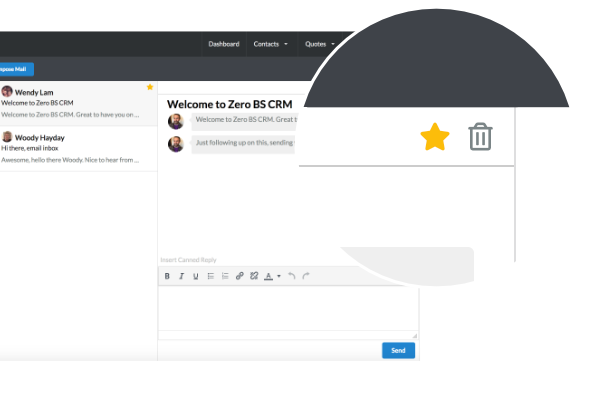 With Zero BS CRM Emails, all your outgoing communications from your team to your contacts are logged. See what was sent and when. Writing that email is now a piece of cake. From the Emails page simply hit Compose Mail and start writing that email. Once sent, you can see it in your Sent Emails panel. Check in and see if your contact has read the email and follow up if need be. Sending a lot of emails? Yet you still have those extra special few emails that you want to keep at the top of your mind. Simple. Star them and see them in their own panel from your emails page. Save yourself time with Canned Replies. Find that you are writing the same thing over and over? 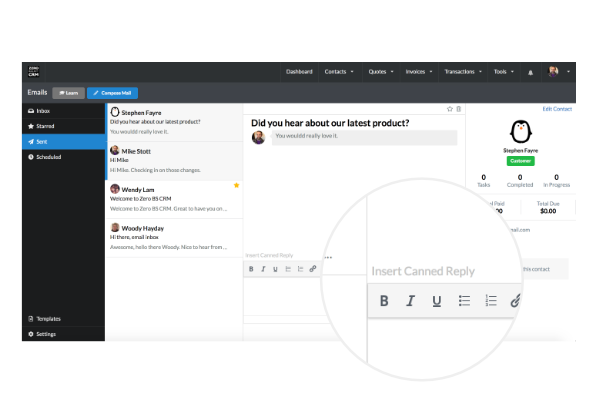 With Canned Replies you can easily insert the standard replies into your emails. Got emails that have gone dry and you don't want to keep in your database. You can now easily remove them from the system. 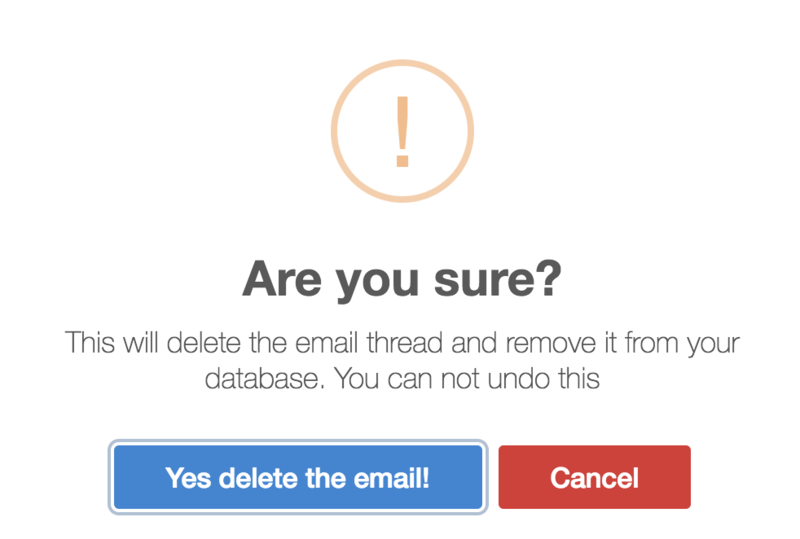 Free up some database space by pruning those unwanted emails. 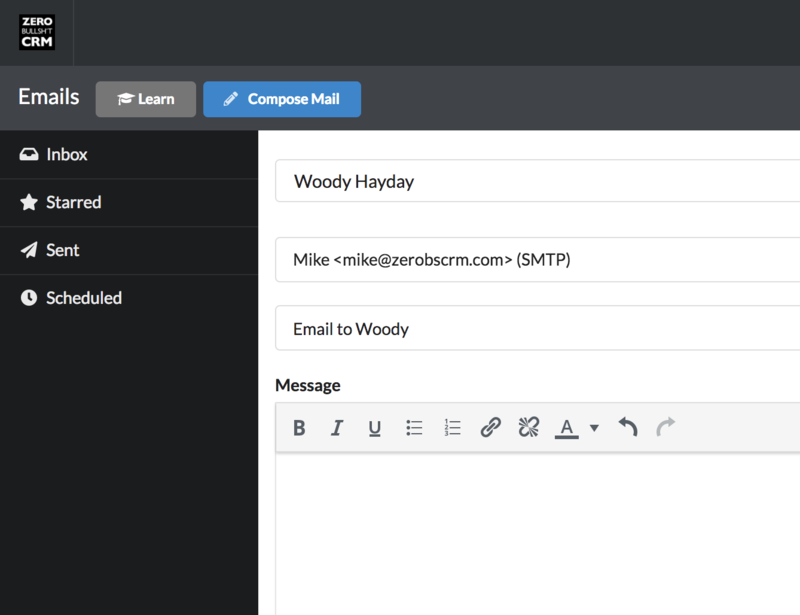 Capture incoming emails with our Zero BS Inbox. This feature is currently being voted for on our Coming Soon page*. If made, it will require a $20~ per month subscription to our ZBS email parser service, which would automatically parse emails from your inbox(s) into to your CRM. *email parser potentially coming soon, please register your interest with a support ticket, telling us why you need this! We have known since day 1 how important emailing your contacts is to closing sales. 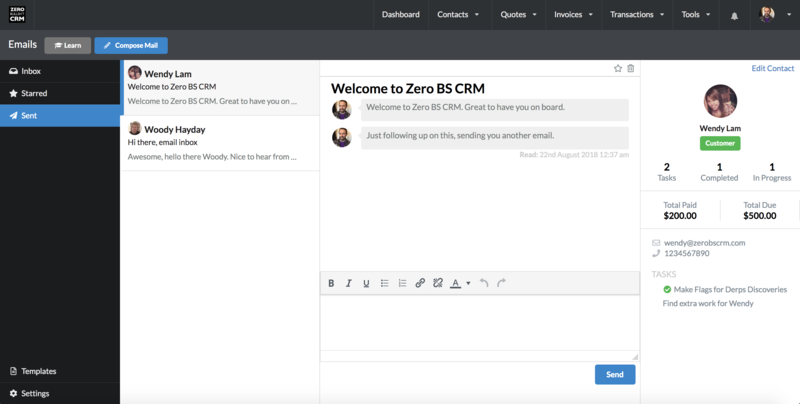 Zero BS CRM now acts as your shared outbox. Keep track of who sent what and keep inching those contacts closer to becoming customers.